You are here: Home 2016 September How to Change a Switch Member Number in a Cisco 3850 Stack? …How to change the logical switch assigned number in a stack manually so it matches a desired order. The information in this article is based on the Cisco Catalyst 3850 Series Switch that runs Cisco IOS-XE Versions 03.03.00 and later. The information in this article was created from the devices in a specific lab environment. All of the devices used in this document started with a cleared (default) configuration. 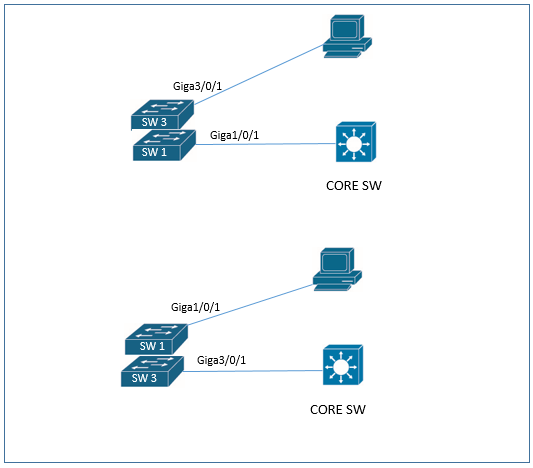 If your network is live, make sure that you understand the potential impact of any command. New switches have number 1 as stack member number by default, however when a switch joins a stack it changes to the lowest available number. For example, if SW 1 has 1 and SW2 has 3 as their stack member number, when the new switch SW3 joins the stack it will change its member number from 1 to number 2 since it is the lowest available number in the stack. WARNING: Changing the switch number may result in a configuration change for that switch. In this case, we are changing the member number of the switch 3 to number 1. A WARNING message is logged after the command is used stating that a configuration change will occur. As an example regarding this Warning message, let’s say configuration in Gigabitethernet 3/0/1 is an access port in vlan 10, and Gigabitethernet 1/0/1 was a trunk interface connecting to another switch. When the renumbering change from switch 3 to switch 1 occurs, the trunk interface that should be connecting another switch is now connected to a PC and the interface which is configured as access is now connected to a switch! Renumbering members of the stack manually should be done in a mantenaince window since issues like the one described above could cause a network outage.